Kevin Gallick has been principal of Washington High School since 2012. The school has the highest neighborhood student enrollment rate of all high schools in the city. CHICAGO — If the neighborhood high school in Chicago isn't dead, it's on life-support. While students have long eschewed their neighborhood school for selective enrollment or private schools, the trend has accelerated recently. Ten years ago, nearly 45 percent of students went to neighborhood high schools. The decline could accelerate even more in the future, with plans to make choosing a school other than a student's local one even easier next year with a single application. The application would be used for neighborhood, charter and selective-enrollment high schools alike. In the past, students had to apply separately to each charter school they were interested in, but now they could be offered a seat at a charter school instead of their neighborhood school. Janice Jackson, CPS' chief education officer, said the district has "taken a vocal stance on neighborhood schools being promoted and being a school of choice." But in recent years, neighborhood schools that guarantee seats for local residents have been on the losing end as the growing number of non-neighborhood schools, coupled with demographic changes, have bottomed out their enrollment. In 2006-07, there were nine charter high schools citywide. Today, there are 71. Jackson acknowledges the district has promoted giving students and parents a choice of neighborhood, magnet, selective-enrollment or charter schools. "I don't think it's people abandoning neighborhood schools," Jackson said. "I think we know that there's a degree of competitiveness within schools and we make sure there's balance there. Parents have choice and we do want parents to choose based on their values." But others say CPS' decision to promote charter schools and other alternatives has led to the current situation. West Town's Wells High School, 936 N. Ashland Ave., has a neighborhood enrollment rate of 7.1 percent — and the principal points to the prevalence of charter schools as the main factor for that miniscule number. "The primary reason why we don't have students in general, but in particular neighborhood students, at Wells is we are in a location surrounded by 13 charter schools," Principal Rituparna Raichoudhuri said. Jennifer Johnson, the Chicago Teachers Union education issues manager, said the system was inherently unfair to neighborhood schools that have been underfunded in the past. "A market system when you don't have equity of investment is inherently going to make inequity," she said. "The district has created all these veneers of choice. ... You see a shiny new charter school, but there may be some great things going to your neighborhood school that you don't see. You've got to create an equal playing field." The huge drop in neighborhood enrollment has also taken place in Englewood, which is home to three neighborhood high schools and nine other schools including charters. While the area's population is declining, the Englewood high school-age population is the sixth highest in the city. But only 11 percent of students attend their neighborhood high school. More than 4 of every 10 students travel four or more miles away to go to school. Some Englewood residents like having additional options where they can send their kids. 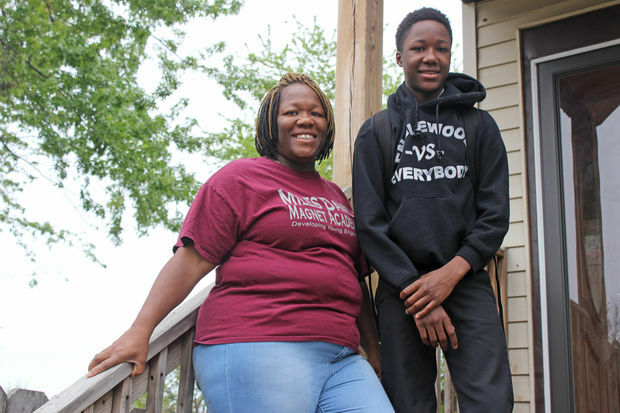 West Englewood resident Carol Stewart sent her 14-year-old son Demetrius to Miles Davis Magnet Academy, a magnet school without neighborhood boundaries on 67th and Paulina. Nor will he enroll at Harper High School, 6520 S. Wood St., which has a 9.8 percent neighborhood enrollment rate. The school received the second lowest academic ranking from CPS and has a "very weak" safety rating. Instead, Demetrius will attend Urban Prep Academy's Englewood Campus, a charter high school at 6201 S. Stewart Ave., like his older brother. "I like the positive black male role models they offered. We don't see a lot of black male teachers in the neighborhood schools," Stewart said. "I like the structure and self-respect reinforcement they push." Still, Stewart did think it was important to send her child to school that was relatively close to home. “A lot of parents [believe the] stigma that if they go outside of Englewood it'll be a better education, but it's not,” she said. "There are lot of gems in Englewood. People don't take the time to research and look into different schools." CPS plans to build a $75 million "state-of-the-art" high school where Robeson sits now, merging Robeson with three other high schools with plummeting enrollment: neighborhood schools Harper High and John Hope Academy and TEAM Englewood Community Academy High School, which has no attendance boundaries. "There hasn't been a new school since the 1970s," Jackson said at the plan's unveiling. "This $75 million investment is coming to a community that hasn't had this level of investment in decades. This is worth celebrating and is remarkable." The teachers union's Johnson acknowledged the new high school could encourage students to stay in the neighborhood but said more needed to be done across the city. "This single school may improve enrollment in this neighborhood, but there's not a system-wide plan," she said. "It's a piecemeal investment." On the other end of the spectrum are well-attended neighborhood high schools on the edges of the city, particularly on the Far Southeast Side. East Side's George Washington High School has a neighborhood enrollment rate of 61.4 percent, the highest among high schools. One of Washington's feeder neighborhood elementary schools, Marsh Elementary School, leads all neighborhood elementary schools with 94.2 percent of its neighborhood children attending. "These schools have done a good job of establishing a neighborhood institution and a great job of creating a school culture," said Beatriz Ponce de Leon of Generation All, a nonprofit group supporting neighborhood schools around the city. "That doesn't mean that all the kids are high achieving but it shows a school that is serving its population." The area has fewer charter options and students are less willing to travel long distances to attend other city schools, though Washington Principal Kevin Gallick said students choosing selective-enrollment high schools like South Loop's Jones College Prep or the closer Brooks College Prep definitely impacts enrollment at Washington. Reputation and neighborhood traditions push students to their nearby schools, even if some go reluctantly, according to administrators and parents. "Kids say it all the time. Every year you'd be talking to seniors and the senior would say, 'I didn't want to come here. Then I ended up here and it ended up being great,'" Gallick said. Gallick took over as principal in 2012 and despite some rockiness that led students to stage a sit-in to let him keep his job, the school's neighborhood population has remained level. Parents attribute that success to the school's performance: Washington will send at least half its seniors to college next year, and the school offerings include an International Baccalaureate program. "Having this school as our local school, just for us? I'm not greedy but I like being greedy at this point," said Alejandra Plascencia, a Washington parent. The South Loop has been Chicago's fastest growing neighborhood in recent years, nearly doubling in population since 2000. Currently the neighborhood high school serving the area is Phillips, which has boundaries sprawling as far north as Wacker Drive and as far south as Washington Park. Just 7.2 percent of neighborhood teens attend Phillips. Distance and Phillips' school rating have played into the desire to bring a new school closer to Downtown. CPS announced plans to open a new high school to serve South Loop high schoolers (and nearby Chinatown) by replacing the National Teachers Academy elementary school, a controversial choice for some given its own status as a neighborhood elementary school. "Not everyone is getting into St. Ignatius or Jones College Prep High School," Tina Feldstein, president of the Prairie District Neighborhood Alliance, a South Loop development group, said last year. "More people are great, but we need a new high school. We need to keep people here." Schools on the West Side and in communities that have seen demographic shifts in wealth, such as West Town and Humboldt Park, have neighborhood enrollment levels more on par with Englewood than the Southeast Side. 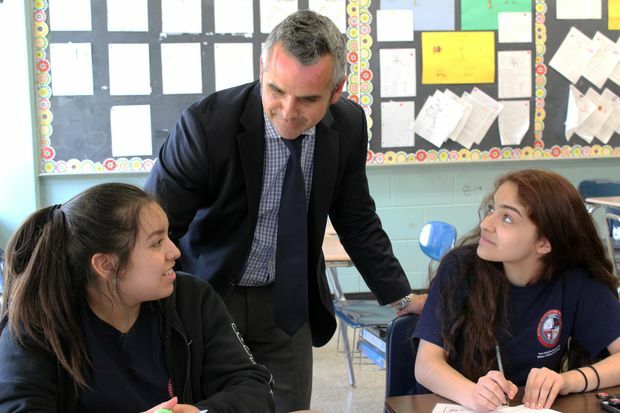 In addition to the 7.1 percent neighborhood enrollment rate at Wells High School, Roberto Clemente High School at 1140 N. Western Avenue in nearby Humboldt Park has a neighborhood enrollment rate of 10.6 percent. Principals at both schools acknowledge that Chicago Public Schools is now basically a system that emphasizes school choice and they know it's important for neighborhood schools to show they're a viable option. But charter schools often have aggressive marketing efforts aimed at attracting students, something traditional CPS schools have only begun recently and on a limited basis. Wells' Rituparna Raichoudhuri, though, believes the system has hurt equality, not enhanced it as CPS argues. "The prevalence of choice that we have in Chicago has been a detrimental force toward racial and income level separation in our city," she said. White students are less likely to attend their neighborhood schools, but do enroll at selective enrollment schools, for example. Just 10.2 percent of students at neighborhood high schools are white, compared with 23.5 percent of the population at selective-enrollment high schools like Whitney Young and Walter Payton. Raichoudhuri said the best way to improve a neighborhood is to invest in the local school. "If I'm committed to the betterment of my community then I'm going to invest in my neighborhood school. The primary way is to send my child there," she said. Both Raichoudhuri and Clemente Principal Marcey Sorensen say they are now reaching out to elementary schools and community organizations to show off what their high schools have to offer. "We are in a system where choice exists. That's not a secret," Sorensen said. "The end goal in our hearts are the same thing: People want good schools, period." David Matthews contributed to this report.